Henry Hoffman and Gary Klein were a couple of Long Island songwriters without a hit. They'd been submitting their songs to various New York publishers, figuring it was just a matter of time until something clicked. Seville Records, a small label founded in 1960 by Danny Kessler and Murray Sporn, had finally scored a hit with Ernie Maresca's "Shout! Shout! (Knock Yourself Out)" after two years of trying, when the label's A&R man, Marvin Holtzman (who'd known Kessler since the early '50s when they worked together at Okeh Records), came across Henry and Gary's insightful examination of the mind of the modern female teenager. It was a little tune declaring 'You're not a kid anymore! '...basically sending a message to any girl ten or older to go out and latch onto some unsuspecting young boy. Everyone at the Seville label was sure "Bobby's Girl" had the makings of a hit...provided they could find a talented, age-appropriate singer who could convincingly convey the message. 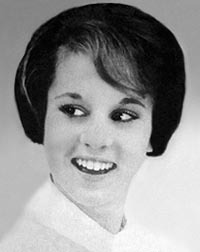 The single, crediting her as Marcie Blane, started getting airplay on New York stations at the beginning of October '62. Someone over at Philips Records in England had his or her ear close to the ground on this one; before Seville could even think about licensing the record for U.K. play, Susan Maughan (signed to Philips a year and so far hitless) was already getting major play in the British Isles with her cover of the song, which hit the U.K. charts in October...a week before Marcie's original charted in the States! Both versions reached the top ten in their respective countries the third week in November. Of course, here at home, we had no idea there was another version of "Bobby's Girl." Maughan's delivery lacked the guilty pleasure of Blane's youthful desperation, owing perhaps to Susan's age (mid-twenties) and considerably more mature sound. Bobby Rydell couldn't resist the temptation to put out his own version of the song, adjusting it to his perspective ('...say you wanna be Bobby's girl') and releasing it as the lead track on his album All the Hits by Bobby Rydell Volume 2, generating some nice bonus royalties for writers Hoffman and Klein. Girl group The Sherry Sisters put out an answer song, "Stay Away From Bobby" on the Okeh label, a considerable departure that had little to do with Marcie's hit beyond the boy's name in the title. While all this craziness was going on around her, Marcie was feeling overwhelmed by the prospect of fame and stardom. She had enrolled in Queens College and was making an effort to focus on her studies. The Seville crew, on the other hand, was busy plotting her future. "What Does a Girl Do," another Hoffman-Klein song, became the follow-up single in early '63 but stalled in the lower regions of the charts and was gone by March. A shame, too; it took the first single's subject matter to the next logical level, though it was perhaps a bit suggestive, offering questions of concern like '...now he wants to park where it's...awfully dark...ooohh, what does a girl do?' (the way I see it, you have two options, Marcie: go along with him...or RUN!!!) Bobby's name is absent from the lyrics, but if he was the guy she (or more accurately the songwriters) had in mind, he was taking advantage of her confessed feelings...and giving her a life lesson we all learn, sooner or later. Several more singles were released, each depicting a different teenage scenario, with titles like "Little Miss Fool," "You Gave My Number to Billy" and "Why Can't I Get a Guy," but none of them made it out of the gate. Her sixth single, in 1964, revived the object of her affection; what "Bobby Did" was...he dumped her! The song was written by Neil Diamond, at the time working as a writer at the Brill Building, still a couple of years away from his own breakthrough as a singer. 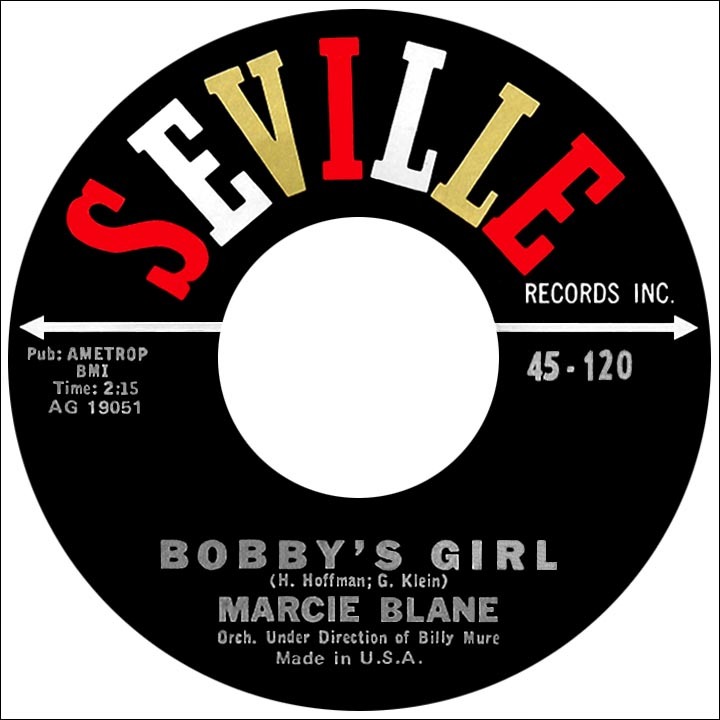 In 1965, Seville released one final 45 by Marcie, "The Hurtin' Kind." Susan Maughan's career in the U.K. followed a similar pattern to that of Blane's; after two lesser follow-up singles, she never hit the charts again. Marvin Holtzman spent some time in England shortly after discovering Marcie; he produced a number of records there in 1963, including The Bachelors' number two smash "I Believe," which was also a hit in America the following year. Henry Hoffman and Gary Klein were unable to repeat the success of "Bobby's Girl," though Klein continued his efforts, collaborating with Art Kornfeld on "Guess Who?," recorded by Dusty Springfield in 1964; later, Klein became a successful producer, working with Gary Lewis and the Playboys, Glen Campbell, Barbra Streisand and countless others. Marcie Blane chose not to pursue her singing career any further, admitting that all the attention and pressure had been too much for her.